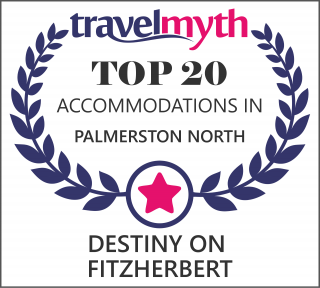 Destiny on Fitzherbert strictly enforces a 'No Party & Noise Policy' for the comfort and security of all guests, and will not tolerate excessive noise at any time. Guest who do not comply with these policies and disrupt the peace and quiet enjoyment of other guests will be required to vacate the premises immediately and without refund. We would appreciate your account being settled by the method you indicated at check in. Credit Cards accepted are: Visa, Matercard, American Express. Please note a surcharge of 2.5% applies to AMEX. Destiny on Fitzherbert does not accommodate pets. Please ensure when leaving rooms unoccupied that all doors and windows are securely locked. We do not accept responsibility for stolen property. Ground floor outside your private patio.